While the results are awesome and projects work up quickly because the yarn is so big, T-shirt yarn can be a little difficult to work. You'd think (being made out of T-shirts) that the yarn would be stretchy and easy to work with, but it's pretty firm and can strain your body if you work with it too long in one sitting. Here are some tips to make working with t-shirt yarn a little easier. Use knitting needles that are even larger than you think would make sense. Unless your yarn is very fine, a needle in a range of size 11 U.S. (8 mm) and up will work best for you. Needles that are a little slippery can be helpful for working the stitches more easily and evenly with T-shirt yarn. Some knitters use plastic circular needles, even when working flat. Cotton T-shirts are meant to be stretchy, but the less you pull on and stretch the yarn as you work, the better off you'll be in terms of getting an even tension and having stitches that don't look distorted. On the other hand, it's difficult to cut numerous shirts so that they make yarn that's the same width (unless you use a rotary cutter and a ruler), so there are naturally going to be variations throughout your project. You'll probably also run out of yarn in the middle of a row and have to change colors. That's fine. It all adds to the organic look of a recycled knitting project. If you're making your yarn, try to use seamless shirts. It's not a huge deal, but the side seams in a shirt add bulk to your yarn, and sometimes you'll see the seam in your finished project, which might detract from its appearance. You're probably inclined to choose plain colored shirts or shirts with logos and only using the part without printing. But it can also be fun to use shirts with a print or even shirts with stripes. Especially since T-shirt yarn projects tend to have a scrappy look naturally, they don't have to match. You might have decided to make the T-shirt yarn simply to recycle shirts, but now you wonder what project to use it with. A great idea is to check out projects on Ravelry for inspiration. 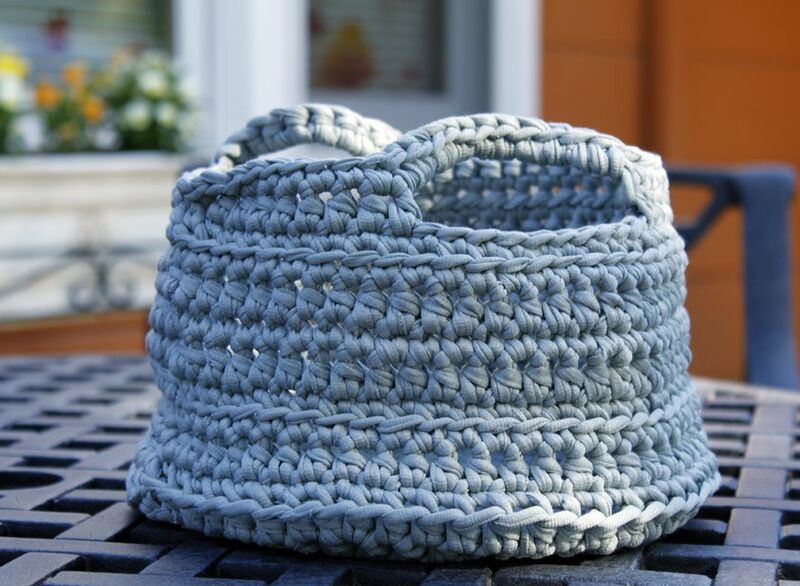 There are projects for hot pads, washcloths, hats, bags, bibs, and bowls.